Baba Ram Singh was born at village Bhaini Raiyan, district Ludhiana on the 3rd February, 1816 A.D. His father Bhai Jassa Singh, was a carpenter. His brother-in-law, Sardar Kabul singh was a gunner in the artillery of Maharaja Ranjit Singh. 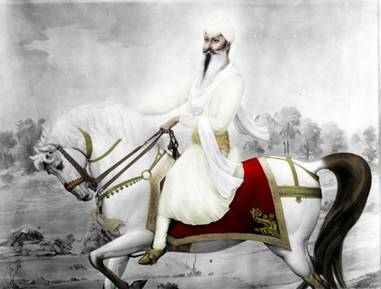 In 1837 A.D., He took Baba Ram Singh with him to Lahore and got him recruited in the regiment of Kanwar Naunihal Singh. On the 18th December, 1845 A.D. the Sikh army suffered a defeat in the battle of Mudki due to mean settlement of some Dogra Generals of Sikh army with British. Baba Ram Singh could not bear the defeat of the Sikh army in this manner. He left the service of the army at Mudki and came straight to his village Bhaini. On arrival at his village, Baba Ram Singh started preaching, "Worship of eternal Being, giving up worship of the dead, keeping off the intoxicants, giving up meat, minimum expenditure on marriages and widow remarriage etc." He used to say, "I am only a messenger or a reporter and not a guru." His followers starting calling themselves 'Namdharis'. Baba Ram Singh was a supporter of reform of the 'Mahants' and priests of the gurudwaras as a result of which they were against him. Every year, on the occasion of Diwali or Baisakhi fairs he used to go to Amritsar and put his views before the congregation. The number of his audience used to touch twenty thousand. He started a movement in 1848 A.D., to force the British to leave India. He called upon his followers to boycott foreign goods and Government departments due to which people stopped buying imported cloth, gave up taking their disputes to courts and started deciding these in villages. The boycott movement of Baba Ram Singh had great effect on the work of the Government. In 1863 A.D., the Government setup a police post at his village Bhaini. Cow Slaughter was banned in Amritsar during Sikh rule. In 1870 somebody spread a false rumor in Amritsar that the Government was about to give permission to the butchers to slaughter cows in the holy city of the Guru. On the 14th June, 1870 A.D., a group of Namdharis beheaded four butchers at Amritsar. Four Namdharis were hanged and two were imprisoned for life for that crime. On the 15th July, 1872 A.D., some Namdharis had quarrel with the butchers of Malaud and Malerkotla over cow-slaughter in which ten people were killed and seventeen were injured. The deputy commissioner of Ludhiana, Mr. Crown pronounced death sentence on sixty-eight Namdharis. Forty-nine of them were blown by cannon fire and nineteen were hanged. Baba Ram singh was exiled to Burma. He went to his heavenly abode on the 29th November, 1885 A.D., in jail of Margee Island. Although the Government crushed the Namdhari movement, yet they could not extinguish the light of freedom lit by Baba Ram Singh.